Family, Stamping and FOOD! : Wordless Wednesday: Pucker Up! Boo-Boo started doing this new thing for kisses. He puckers up like a duck and begs for kisses. 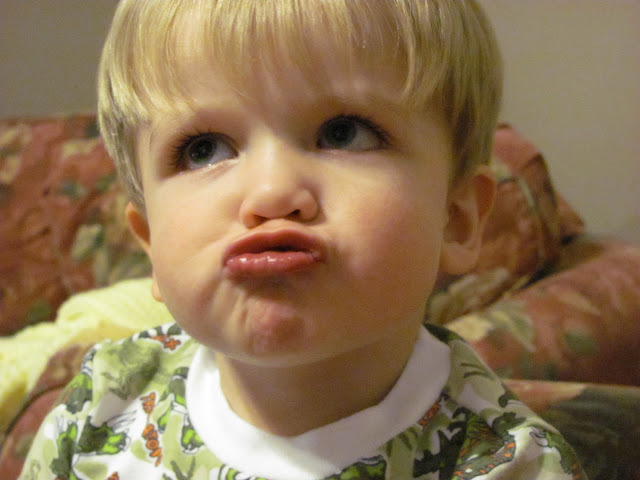 The other day my brother stopped by to see the kids and before he left, Boo-Boo puckered up and pointed at his lips until my brother bent down for his little peck. So funny! Absolutely adorable, nothing sweeter than a kiss from such a cutie! Who wouldn't want to kiss those sweet duck lips! LOVE IT!! Nothing better than those sweet toddler days. Happy WW! What a face! That is simply adorable. Little children's kisses are so precious. Absolutely adorable! I love the pic! My little guy is 2 and he just started doing this same thing. You've inspired me to try to capture it on film. It's so cute! !